Smart Energy GB said suppliers "are working hard to offer all households smart meters as soon as possible". A spokesman for the independent body which is responsible for promoting the scheme, added: "In line with the government's figures, smart meters will help people save on average almost £50 a year on their energy bills by 2030." 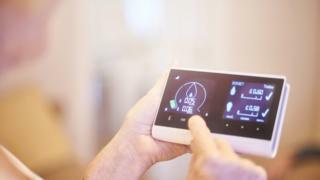 But Alex Neill, managing director of home products and services at Which?, said: "The smart meter rollout has been plagued by problems and been massively delayed, the benefits have been overstated and the savings they could bring consumers are at risk." She added: "Therefore it's time for the Government to replan with industry and consumer groups to ensure people get the maximum benefit at the minimum cost." So far, large suppliers - that are defined by Which? as those with 250,000 customers or more - have installed 11 million smart meters, which show people how much energy they are using and the cost in pounds and pence. A spokesman for the Department for Business, Energy and Industrial Strategy said: "The government is committed to all households and small businesses in Great Britain being offered smart meters by the end of 2020. "Suppliers are ramping up their operations over the next 12 months as they recruit and train even more installers." In July, the cross-party British Infrastructure Group said it believed that the 2020 target for the £11bn roll-out would be missed and questioned "whether the programme will even deliver meaningful returns for consumers at all". E.On has installed 1.4 million smart meters and said it "firmly believe in the benefits they offer customers". A spokesperson for EDF Energy said: "We are on course to achieve our targets for 2018." Npower said it had installed a total of 428,088 smart meters, "meeting targets agreed with Ofgem", the energy regulator.